Hundreds of young Karen people dressed in their traditional clothing file into a large open-air building in Karen State, a booming series of “hello… hello… hello…” tests a sound system stacked on the edge of a stage. The traditional dress sound system and stage are signs that the Karen Youth Organisation’s celebrated its 25th year in May, more than one thousand people attended the official celebration marking the anniversary in Karen State. Karen News spoke to several young people attending the ceremony about their concerns and hopes as Burma goes through political changes. Naw Hser Nay Kaw Thablay Paw Kel, 18, is in her first year studying an English major in Burma. She says that the greatest concern for young Karen people in her area is a lack of educational opportunities. “We need to explore and decide which is best for each of us as young people,” she says. Naw Hser is involved with a youth organisation that helps train young people and says that in her experience, avenues for young Karen to learn information technology skills in particular did not exist. While attendance in primary education is relatively high in Burma, according to UNICEF statistics, only half of young people participate in secondary school – often because they need to work to help support their families. The fight to retain cultural identity for young Karen people in the big cities is very real, says 18-year-old Saw Jubilee Kha, a second-year university student studying economics and history at Yangon University, but originally from the Irrawaddy Division. Smoothing back his hair in the light rain, Saw Jubilee says that when students joined university they had to sign a statement, which barred them from political activities, but that he felt a duty to attend the KYO event. Saw Eh So Tay, the KYO president of Thaton region, says that many young Karen people are still living under oppression even with the installation of a reformist, though military-backed, government in 2011. 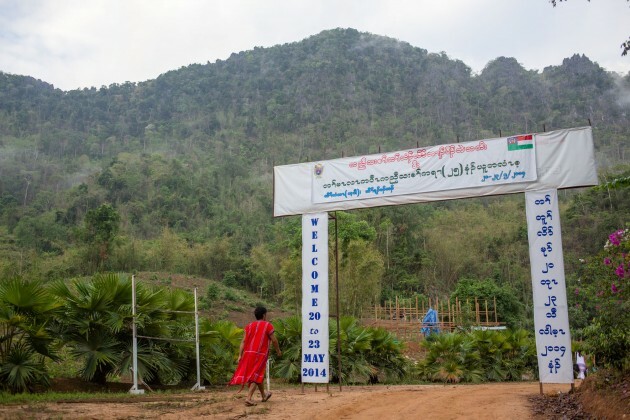 Naw Paw Eh cautions that many Karen organisations were still outlawed in Burma and members of the groups could be persecuted under current laws. Naw Paw Eh dreams of freedom for Karen people and hoped of a brighter future where everyone had a decent education. KYO state on their website say that they have 40,911 members.